The basic of mountaineering starts here. 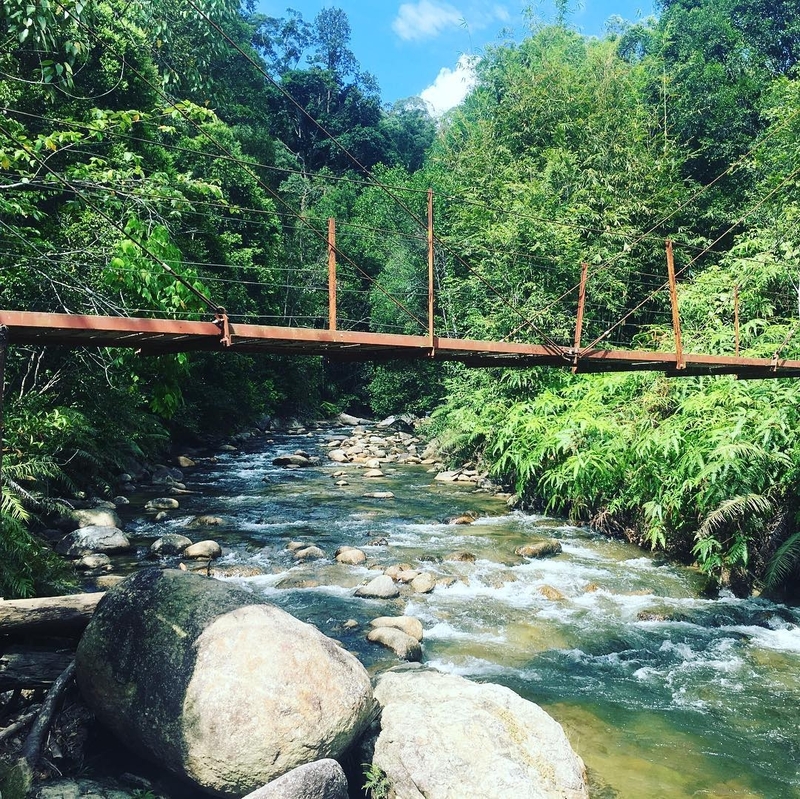 Compared to the other mountains to hike, Gunung Nuang is a great site for hiking and trail running as it takes more time to complete it and far more challenging. It is the highest peak in Selangor and offers eye catching views on a clear day. What to expect? Gunung Nuang is situated in the Hulu Langat district of Selangor state is often described as Selangor’s tallest peak but according to the list of Malaysia’s Tallest Mountains, it is only the 3rd highest after Gunung Semangkok and Gunung Ulu Kali. Gunung Nuang is 1439 metres high making it the 86th highest peak in Malaysia. Although it is a relative baby in Malaysian terms, it is still a good size- higher than any mountain in Britain (Ben Nevis is 95m shorter). On the beginning of the trip, you are required to pay RM1.00 for the climbing fee. Gunung Nuang trail start with a cement road which is easy for a distance of 5 km, which some described as the ‘never-ending road’. It gets harder once you reach Camp Solo (6 km) where some people chose to camp overnight before tackling the next stage of the climb. Next stop is Camp Pacat which is 1.2km and approximately 150 minutes away. This is where the hard work starts. The path was mostly deeply rutted clay which can turn into a nightmarish torrent during heavy rain. After Camp Pacat, the next stop is Camp Pengasih which is another 1.2km away. The sign might say that it will take 40 minutes to reach there but most people took 60 to 80 minutes to reach. The path was steeper compared to the other trails. In one or two places there were breaks in the vegetation and you could get an encouraging view of the mountains. After you reached the false peak (Camp Pengasih), it will take you about 40 minutes to climb up to the “Puncak Nuang”. On the top there is a small open area where jubilant climbers were enjoying the food they had to painstakingly lugged to the top. Through gaps in the bushes there were far-reaching of beautiful views as the visibility was good. The total time estimated to reach the top from the starting point is around 5 to 6 hours while going back down is also estimated 4 to 6 hours where the total time taken to complete the journey is about 10 to 12 hours trip! Facilities such as bathroom, parking space are also available there. What to bring? Also, carry sufficient water supplies for a 10 to 12 hour’s hike. 3 litres of water might be enough. Some websites might say you do not need to carry so much water as you can fill up with river water at Camp Solo, but personally you should not risk drinking river water except as a last resort. Insiders’ tips We recommend you to start the hike at 5:30 am as so you have higher chances of having clear visibility at the peak and reduce the likelihood of getting caught in afternoon thunderstorms. Make sure to wear hiking shoes with good grips and comfortable socks. You could also bring along a pair of cheap rubber shoes to change into for the river crossings. By the time you have descended from Gunung Nuang you might feel you had enough exercise for the day and wish to avoid repeating that 5km ‘never ending road’ back to the car park. There are some local boys offering ferrying people on the backs of their motorbikes along the long road with a fee. This is probably only available on weekends. What to see there? Experience Malaysia forest. There are no reviews on Camping at Gunung Nuang. If you’ve been here before, write a review to share your experience.